Clarke Art Consulting had the pleasure of interviewing sculptor Carl Wright. 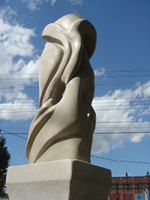 Wright creates abstract sculptures to evoke emotion and everlasting beauty. His work can be seen in corporate buildings in North Carolina, and private collections in Switzerland, Orlando, Washington, D.C. and Virginia. 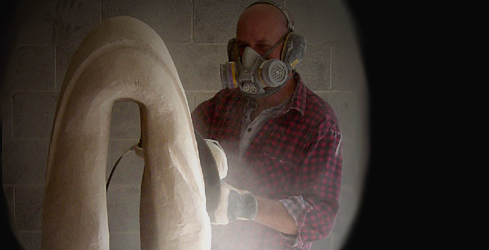 Can you tell us a little bit about your background, and what led you to become a sculptor? Before evolving to sculpture, I had been a stained glass artist. With stained glass I liked the vibrant colors but disliked the perpetually cut fingers [ from sharp glass edges]. I didn’t like the need to go to craft festivals to sell work, and how price-driven the medium was. While working as a stained glass artist it occurred to me that I enjoyed dealing with space and how objects occupy that space. This led me to designing and building studio art furniture and quickly thereafter to sculpture. Stone is my medium of choice. I enjoy the solidity of the stone, the primal nature of stone (re: Stonehenge), its ability to withstand eons of weather and abuse, and still stand. I also enjoy the warm sensual nature of stone. For marketing purposes, I wanted a durable long lasting medium that has an august presence, a decent market to sell, and not engaged in by a lot of artists. For practical reasons, I wanted a medium that could be placed inside or outside, did not have major maintenance issues ( such as steel, plaster, & wood), was not brittle like ceramics, and could not be easily stolen for scrap (such as bronze, steel, aluminum). Your art is abstract. Can you say something about your approach to creating such work? Working in stone is a waltz between the sculptor and the stone. Sometimes the sculptor leads and sometimes the stone leads. To illustrate, sometimes when working on stone you hit a soft spot right where you wanted to stop—to preserve the original design. The soft spot should be worked out so that this is not a problem later on for your client. Or, occasionally a bad blow from the hammer causes much more of the stone to cascade to the floor than you planned. It is at those times the stone is leading the dance. As to the actual creation of the work, there are two major ways that are usually used. The first is coming to the stone with a general direction to illustrate a concept—an intuitive way of creating. The other way is much more passionate or driven. This is where I have a dream of a piece, wake up hurriedly, sketch it out then go back to sleep. Usually the creations from dreams are more dynamic. Both ways of creating works make great sculpture. The difference is that with the dream-driven sculpture it consumes more of your free time with thinking about it, planning your next step, etc. My sculptures usually falls into five major series, which are: the Motion Series, the Striving Series, the Music series, the Tranquil Series, and the Exuberant Series. Each sculpture relates to one or more of these series. The Music Series being added to most often these days. Isamu Noguchi for the quiet, but insistent line and form; Jean Arp for the undulating surfaces and forms; and Barbara Hepworth for showing that sculpture can be pierced and still be monumental. There are other sculptors I admire: Houdon and Anish Kapoor for their surface treatment, and Anish Kapoor & Richard Serra for their gutsy treatment of a sculpture. How have people responded to your art? People respond very enthusiastically to my sculpture. It is always gratifying to have a new client come in and say that he/she walked into the gallery, saw my sculpture, and the rest of the gallery faded away. At shows, I find that people are drawn to caress my sculptures. They look guiltily around but touch anyway [you are not supposed to touch art but gaze at it from afar]; that is a very gratifying experience for me. Stone can easily deal with the touching and caressing with great aplomb. Looking at, or buying stone is a love affair. Love affairs need that touch, so does stone.